Bina Darabzand, a leading member of the Consistency Committee to Establish Workers’ Organizations in Iran, and his son Oktai, a journalist and blogger, have recently fled Iran due to threats by the Islamic Republic regime against their lives and security. They have sought refugee status in Turkey; however, they remain under pressure from the Turkish authorities to return to Iran. Given the serious and continuing risk to their lives, we urge UNHCR to expedite the processing of their cases, grant them refugee status as a matter of urgency, and quickly facilitate their resettlement to a safe third country. Bina Darabzand is a prominent activist who has been politically active from the age of 15, first against the Shah’s dictatorship, and then against the Islamic Republic regime. In addition to being a leading member of the Consistency Committee to Establish Workers’ Organizations in Iran, he has also re-started his political blog, http://salam-democrat.com. Numerous labor activists with the Consistency Committee to Establish Workers’ Organizations in Iran have faced persecution and imprisonment for exercising their fundamental rights to organize, and for demanding workers’ rights, including unpaid back wages, fair pay, and benefits. Behnam Ebrahimzadeh, a member of the same Committee, is a political prisoner serving a 20-year sentence for his membership in this organization. Nearly all members of the Committee to Establish Workers’ Organizations have been arrested, beaten, or persecuted by regime authorities in Iran including Shahrokh Zamani and Muhammad Jarahi, who are now serving 11- and 10-year prison sentences, respectively, in Tabriz Prison. Others have been released temporarily and only on the basis of having paid multiple hundreds of millions Tomans in bail. Bina’s son, Oktai Darabzand, is a journalist with a focus on political and human rights issues. Six years ago, Oktai established a weblog called “Aseman Daily News,” which published the news of political prisoners from jail as well as other human rights violations by the Islamic Republic regime. The blog also included social, economic, and foreign news sections. Journalists and bloggers covering human rights news in Iran are routinely persecuted, tortured, sentenced to lengthy prison terms, and even sentenced to execution in Iran; Reporters Without Borders provides an overview of the risk faced by such journalists and bloggers in Iran (link). During the 2009 uprising, Oktai’s weblog was blocked on the orders of the Judicial Power. Immediately, with funding from his father, Oktai opened a website with the same name (http://asemandailynews.com), continuing with his activities. However, in April of 2011, Oktai’s website was designated by the regime as “a PMOI site.” Many members of PMOI (Peoples’ Mojahedin of Irani, or Mojahedin-e Khalgh) – and those accused of affiliation – are condemned to brutally harsh prison sentences and execution. Jafar Kazemi, Ali Saremi, and Mohammad Ali Haj Aghaei are only 3 recent and well-known examples of those accused of PMOI membership who have been executed on that basis. Although Oktai has no political affiliation or contact with any organized group; however, because of his journalistic activities, and because the Islamic Republic has designated his site as being affiliated with PMOI, his life is at clear and unquestionable risk in Iran. Bina and Oktai entered Turkey and registered with the UNHCR. However, they were soon informed by the Ankara Police (Foreign Citizens Bureau) that the Turkish Ministry refused to recognize their status as asylum-seekers; they were given until 8 February 2012 to leave Turkey and return to Iran. Thanks to pressure from Iranian and European supporters, UNHCR accelerated the interview process and contacted the Turkish Interior Ministry and Police, requesting that they respect Bina and Oktai’s status as asylum-seekers whose case is pending review. The Turkish police demonstrated their anger at the pressure that had been exerted on them to accept the Darabzand’s appeal. Ultimately, Bina and Oktai were required to leave Ankara and go to a small town that has no facilities, not even a bus terminal, 3 hours from any city. They are to wait for a response from UNHCR there, but they remain at elevated risk of deportation at any moment. Should they be illegally deported to Iran by the Turkish authorities, not only would they face certain imprisonment and torture, but both of their lives would be at risk. There is an urgent need for people to write to UNHCR in Turkey and request that UNHCR expedite the processing of the Darabzand’s cases, grant them refugee status as a matter of urgency, and quickly facilitate their resettlement to a safe third country. A sample letter follows; we ask everyone to use the sample letter, or write a letter of your own, and send it to UNHCR in Turkey, with copies to the Turkish Interior Ministry, asking UNHCR to take urgent action, given the threat to the Darabzands’ lives, and their current insecure situation in Turkey. 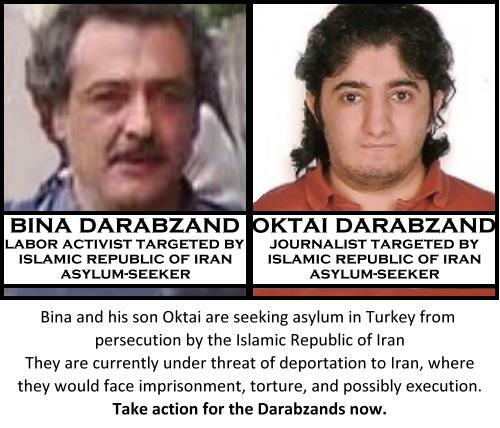 I am writing with regard to the urgent cases of Iranian asylum-seekers Bina Darabzand (UNHCR case #385-11C08824 ) and his son Okatai Darabzand (UNHCR case #385-11C08827). Bina Darabzand is a well-known life-long anti-regime political activist and leading member of the Consistency Committee to Establish Workers’ Organizations in Iran – an organization whose members have all been subjected to beatings, persecution, and lengthy jail sentences. Members who are not currently political prisoners have been forced to flee Iran to save their own lives. Yet leading activists like Bina remain at risk even in Turkey. Oktai Darabzand is a journalist covering human rights and other news in Iran. He is without political affiliation, yet his website has been designated by the Islamic Republic authorities as belonging to anti-regime organization PMOI. The Islamic Republic regime’s notorious brutal repression of journalists and its ongoing persecution of members of PMOI underscore the need for Oktai Darabzand to be granted to asylum and protection. Both Bina and Oktai Darabzand have legitimate claims of asylum, and both remain in danger as long as they remain under their current insecure situation in Turkey. I urge UNHCR to expedite the processing of the Darabzands’ cases, grant them refugee status as a matter of urgency, and quickly facilitate their resettlement to a safe third country.